Tonight, after a busy day, my plans got changed and I ended up home a little before 7pm. 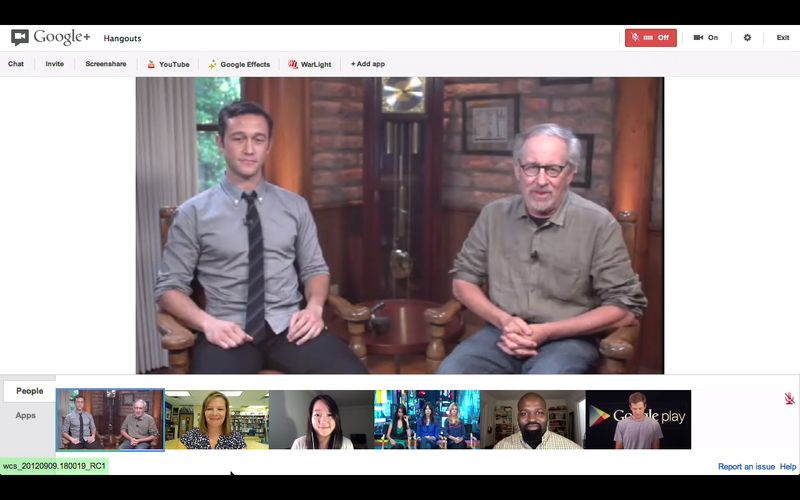 Lucky me, I remembered that Google Play was hosting a Hangout with Steven Spielberg and Joseph Gordon-Levitt. Marketers, Google+ is the place to be if you want to throw some cool events and interact with fans. This particular event was to promote Spielberg’s upcoming film, Lincoln. We saw the trailer for Lincoln and got terrific insight into the film from both director and actor. Spielberg called it “One of the most compelling experiences I’ve had making a film.” As Gordon-Levitt pointed out, that’s no small statement coming from the legendary director. And for those of you who don’t normally like historical films (kind of like me), this film seems to have quite a bit of resonance for today. Spielberg was asked what he wants audiences to take away from the film. His answer was to understand “the burden leadership requires,” which is something we often forget. “The country fell apart,” he added, “and Lincoln had to put it back together.” Much of what he said sounded like things we could say about the state of the country today. Very compelling indeed. I could go on with my review of what I think looks like a fantastic film, but my point of all this is that many marketers could really use Google+ to their advantage. You can actually talk to your audience–in a fun, casual way. Marketers, the more conversations you start, the more people get to know, like and trust you (if you’re being genuine and other-centered). Get on Google+, start using the tools there, and be creative in how you engage. Who knows? Google+ could become your favorite place to hangout. What are you waiting for? The video should be available online soon. Check back at Google Play’s Google+ page. As I post this, it says the video is private, so they’re probably still processing it. Can advertising change the world? Mountain Dew celebrates doing: Do they do it right?